The weather looked a little cloudy in Snow Shoe Saturday morning for the event. However, the clouds cleared out and it turned into a beautiful sunny day. The Gillentown Trailhead started to fill up early for the start of the First Annual Williamsport Honda/CMATVA Dice Run. Registration took place at the Trailhead and the first stop was Newman's Sandwich Shop. Then off to the previous Johnson & Morgan Camp, Peale Crossing and lastly the Moshannon Community Center for the Meal. Snow Shoe Rails to Trails volunteers started accepting applications at the Community Center around 8am and the cooks were busy getting the Spaghetti Dinner Prepared. SSRT purchased a beautiful cake from Hall's Market to support the event. The event was so successful that Williamsport Honda advised Snow Shoe Rails to Trails and CMATVA that they will be supporting the event next year too. So, we want to thank them for their support and would like all of you to stop by their facility in Williamsport and check out what they have to offer. We will be meeting over the next months and compiling suggestions on how to make this event even larger & better. Any suggestions, please let us know. View photos from the event, click here. 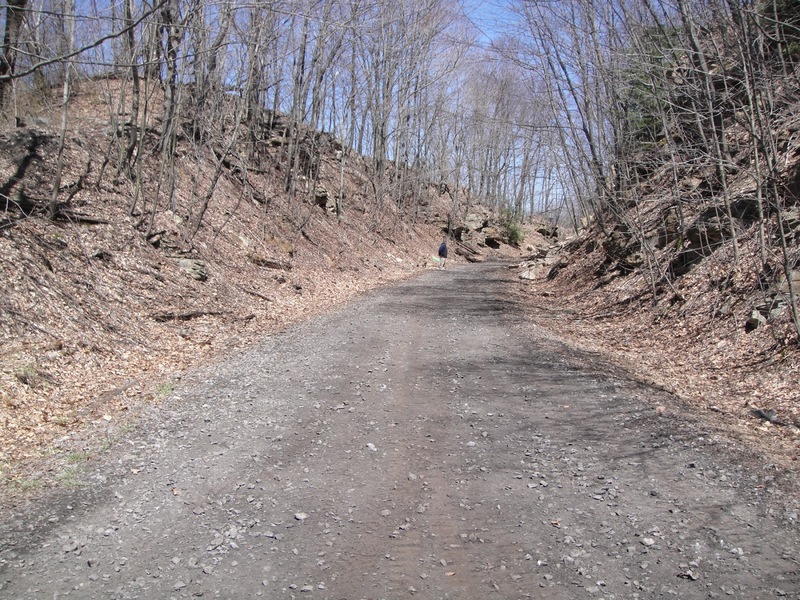 Jack Miller & Larry Mayes spent some time grading the trail from Viaduct Bridge to the Peale Tunnel. They removed the large rocks that slide on to the trail near the viaduct. Jack appeared to be having fun in the skid steer. It was a beautiful morning in Snow Shoe and the Gillentown Trailhead was filling up quickly. This is the first day of fishing season and a lot of atvist were heading up the trail to Black Moshannon and Rock Run streams. The rest of us were on a scheduled work detail by Eric Brooks. Everyone got together at the storage shed to discuss projects not completed from the first work detail. The Centre County Probation Office also provided a group of people to assist with the community service too. All would return to the Gillentown Trailhead and eat lunch around noon. George Holt & Trilby Mayes headed up crews to collect trash on the Tennessee Turnpike to the Kato Bridge. Mark Watson, Jack Miller, Bob Harris led a crew to reinstall the Clarence stop sign that was leaning from the winter months, and clean off Number 10 bridge and trim the brush adjacent to the bridge. Eric Brooks, Larry Mayes, Jack Miller and Bob Harris led crews collecting trash, cutting dead trees, cleaning entrance to Gillentown Trailhead and surrounding areas. Henry Sorgen, John Butts, Jason Billett, Christine McCoy and Kent Little trimmed overhanging trees on the trail near Pine Hollow, collected trash and installed missing DCNR atv signs on Gorton Road. Henry & Jason also layed over a large dead pine tree that was adjacent to the storage shed to prevent it from falling on the shed. Five Pickup loads of trash was collected from the trail and Snow Shoe Township Roads. 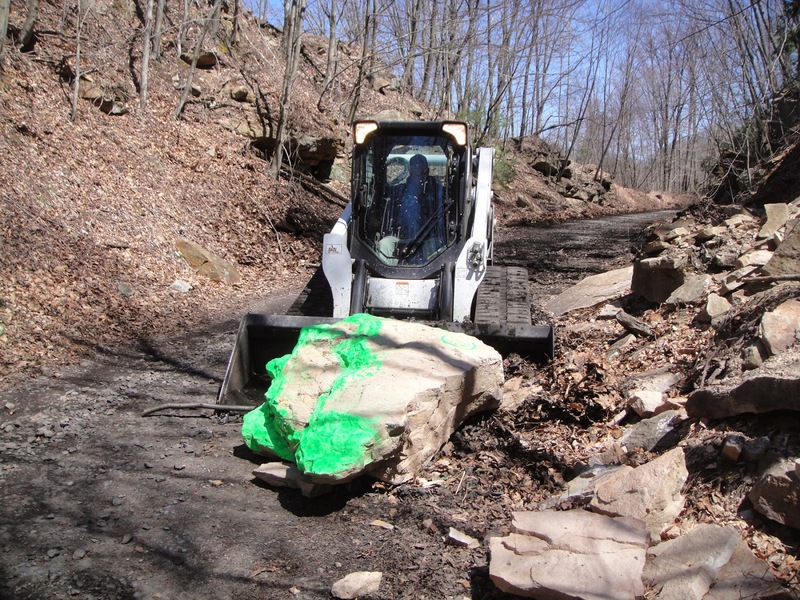 We want to thank all those that volunteered your Saturday to help keep our trail, Snow Shoe Township and state roads clean and also to help with the other work to maintain the trail so it can be safe for all users. April 3, 2014Recent update from Dave Walker. I had a Dr. appointment yesterday and everythinglooks good and I will be returning to work on Monday the 14th. Still don't have my talking voice the same but they say that might come back in time. I thank God everyday for the way things turned out and the many people that helped me get through this especially my wife. I can't say thank you enough times to all of the many club members. Please tell everyone to stop in at the Powersports store for I will try my best to help with any needs on machines or accessories. Recent update all seems to be going good,went to Geisinger in Danville to see my main doctor and I let him know that I have been eating some solid foods,thinking he will give me heck for doing that but he was all for it and said that he is not concerned but my swallowing doctor might,he was there and was ok with it. So that same day I got my feeding tube taken out because I am maintaining my weight. He also asked if I am ready to go back to work which I could not believe due to him telling me when this started it would be four to five months. My next appointment is April first and that's when he will let me know if I can go back to work which he said should not be a problem.I still can not talk right due to the nerve cut in my tongue and no bottom teeth and still have swelling in mouth.which nerve should come back and teeth will come later due to healing. As always thank everyone for being so good to me and my family. I hope to be back to work soon as for Pam wants me out lol, so I can see everyone and we will have to go for an ATV ride. Wishing all a very nice day. I went to see the plastic surgeons and they said that everything looks good so I will see them in six weeks. I then went to see Dr. Kennedy and speech therapist and both looked in my mouth and said things look good and that the swelling went down. The speech therapist gave me exercises to do with my tongue to help the swallowing. It's been a long winter with moving snow and trying to get healed up. I'm looking forward to seeing everybody and keep up the good prayers. Thanks to everyone so much and may good health be with you. Update to all the people I can't wait to see and personally talk to. Believe me that all the people I know are the ones that keep me going. seen two different plastic surgeon doctors yesterday and they told me that I am way ahead of schedule for the surgery I went through. They scheduled my next appointment six weeks from now. I have a doctor appointment Tuesday in Danville with my regular doctor and the swallowing doctor,as I know they will test me to see if I can swallow food which I have been eating different soups with toast so I am very sure of myself being able to swallow food. As of right now I am only suppose to drink liquids but you know me I have to go a little further. I still can't talk all that good but that is from the swelling and the healing of the tongue.overall I can walk on my own and because of all of you is why I am where I'm at today. Thank god and all the people that helped me get through this,it's not over but it can only get better. I sure would be glad to give an update. We went to Danville yesterday to see my main Dr.and the Dr.for the throat to be able to swallow. I could not do that test due to having a viral infection,which the main Dr checked out. He did scope my nose and everything is fine. Right now I feel good but I am on a steroid for swelling in my mouth which in turn makes it hard for me to talk and I also have lots of flem.I also take a medicine for the cold. I go back to this Dr. in two weeks so by that time I hope I can swallow a lot better. I have a Dr appointment this Weds.with the plastic surgeons. My leg is healing nicely and by next week I should be walking normal instead of limping. I do limp so that I do not put a lot of strain on that leg. I would have to say if I go back to see the plastic surgeons, it might be a longer time due to nothing left for them to do except evaluate. Overall the Drs.are happy with my progress and with time for more healing, should be back to where I was, hopefully, except for scars. Originally this surgery was to be on Jan.16th but got moved up due to how big the tumor grew. Yesterday I thanked Dr.Kennedy for having it moved up and doing it quickly. He said if he would have waited till the 16th that I probably would not be here. Again, Pam & I thank everybody from the bottom of our hearts for everything you all have done and keep those prayers coming as I know they are helping. Pam reports that Dave Walker had an appointment this past Thursday in Danville with plastic surgery, for his leg. Everything is healing nicely there. He doesn't need a walker or crutches any longer. He can put full weight on his leg now, but still suppose to take things slowly. All stitches have been removed from the leg. He has 2 appointments in Danville this Thursday. He is still very swollen inside his mouth, but doctors said that will take months to go down. He is drinking water ok though. Please tell everyone thank you for their thoughts and prayers. Dave is doing well and feels better everyday. He's getting bored now and probably pushing himself too much, too soon. Pam has to be the bad guy and tell him there are reasons the doctors put limits on him. He is walking and getting around pretty good. This past Thursday he had some testing done on his swallowing capabilities. That didn't go to good. They had him swallow different foods, different thicknesses, and you see everything getting caught up in the epiglottis in the throat. The epiglottis is a flap that opens and closes over the wind pipe to keep food from going into the lungs when you swallow. The doctor doing this test wanted to set him up with therapy at Health South, his main doctor said it's still way to early for him to be trying to eat & that when the swelling goes down, he feels that will work properly. His main doctor said it will be months before he will be able to eat. A little disappointed in that, but overall he is healing nicely. He still has a lot of swelling and numbness inside the mouth. His speech is improving, but there again, that will also take time. I can understand him ok, but someone else may not. Right now he has weekly follow up appointments. Dave & Pam send their thanks to everyone for your thoughts and prayers. Keep up those prayers because they are helping! Pam Walker advises that Dave is progressing well. He lost about 15 pounds since his surgery but has now started to gain it back. He is presently 6 pounds less than when he entered into the hospital. His liquid food is being feed through the stomach. However, he did have his first small drink of water the other day. In the next weeks he will be working with the hospital to drink difference thicknesses of liquid. The skin from the calf of his leg was used to rebuild the inside of the lower mouth/jaw. A skin graft was taken from the thigh and placed over the calf area where the skin was removed for the mouth. These areas are healing nicely. Dave is using a walker to get around in his house. Drs. say it will be sometime till he can put direct pressure on his left leg. Drs. also state that you can walk without the femur bone as it is used to stabilize the ankle, but not necessary. His stiches have been remove from his chin, & neck and everyone is please with his progress to this point. Pam & Dave want to send their thanks to everyone who attended or donated to the benefit ride/dinner and for the donations still coming in, and for all your prayers. Pam Walker advised that she brought Dave home from the hospital Tuesday. Dec.31. The home health nurse has visited them to assess the situation for Dave. Due to the extensiveness of his surgery and cold and flu season here, Dave is not allowed any visitors. Although they appreciate everyone wanting to help and volunteer at their home, they cannot risk it at this time. There is a long recovery period that Dave will need to have prior to visitors. Pam will notify us whenever Dave can have company. The home nurse will continue to take care of Dave's needs -- Of course along with Pam. They want to thank everyone for your prayers and to continue them as Dave recovers. Pam Walker reports that things going very well. Physical therapy was just here and had him out in the halls with a walker for the first time. Still no weight on the leg yet. Trach is capped off so he is breathing on his own now. Supposed to be discharged either Tuesday or Wednesday. I went home over the weekend to get things ready for when Dave is discharged. I had to move some furniture around and bring up a recliner for him from the basement. He's suppose to be in a reclined position, not flat on his back yet. Doctors told us yesterday that the staples in his neck would be removed next week. Overall he is doing great, making progress everyday. He still has a lot of swelling inside his mouth and that will take a while to go down. Things were pretty rough for a while, but he kept a positive attitude and now looking forward to going home. Take care and thank you to everyone from the SSRTA for all your prayers and everything the organization is doing.